This week I was saddened to hear the news that the composer Sir John Tavener has died. I have always enjoyed the beauty of his choral works such as The Lamb and Song for Athene. Learning of his death also inspired me to find out more about the Renaissance composer John Taverner, from whom the former was directly descended and who lived and is buried in my hometown of Boston, Lincolnshire. John Taverner was born in Lincolnshire around 1490. In the early 1520s he was working as a lay clerk at the collegiate church of Tattershall and in 1524 he travelled to Boston as a guest singer at St Botolph’s Church, better known as ‘The Stump’. In 1526 he was appointed organist and master of choristers at Cardinal Church (now Christ Church), Oxford. The church had been established the previous year by Cardinal Thomas Wolsey and Taverner worked there until around 1530. He spent the final part of his life in Boston, where he was a lay clerk in the choir of The Stump for a number of years. Shortly before his death, in 1545, he was appointed an alderman of Boston. He is buried under the bell tower in St Botolph’s and a memorial to him can be seen in the church. St Botolph’s Church as it stands today began to be built in 1309, but its famous tower was only completed between 1510 and 1520. During this period Boston had a thriving local port which handled various goods for Lincolnshire, although it was much less important than it had been during 13th and 14th centuries when it was greatly involved in the exportation of wool and was the 4th richest provincial town in England; the grand scale of The Stump is a symbol of this wealth. In 1545 Henry VIII granted Boston a charter and it became a borough. Most of Taverner’s surviving music dates from the 1520s and many of his works and compositional techniques were extremely influential right up until the time of Purcell. One example is the mass ‘Gloria tibi Trinitas’; in the Benedictus the section beginning ‘In nomine’ is for 4 voices and the Cantus Firmus (from which the mass gets its title) is heard in the mean/alto part. This passage quickly began to be used as an instrumental piece and many subsequent composers wrote music in the form of ‘In Nomine’. In this performance the In Nomine can be heard at 33:30: Missa Gloria tibi Trinitas. Another of Taverner’s masses is Westron Wynde. In this case the Cantus Firmus is taken from a popular song rather than a religious work and it is believed to be the first mass by an English composer to be based on a secular melody. (Cantus Firmus is the use of a pre-existing melody as the basis of a new polyphonic work). Over 4 centuries later Sir John Tavener continued in his footsteps with an extensive output of religious works inspired by Russian Orthodox theology and mysticism. No doubt his legacy, as that of his ancestor, will influence the future of choral music. 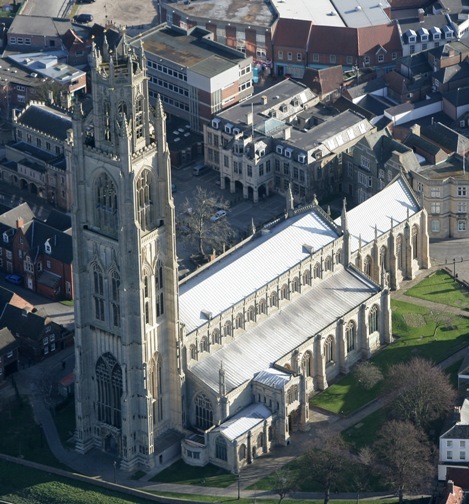 This entry was posted in Uncategorized and tagged Boston, Boston Stump, Cantus Firmus, In Nomine, John Tavener, John Taverner, Lincolnshire, Westron Wynde. Bookmark the permalink.